Hello everyone! Today I'm sharing a couple of cards using stamps by Purple Onion Designs. They have a new adorable colection called "Twas the night before Christmas". ¡Hola a todos! Hoy quiero enseñaros un par de tarjetas que he hecho con sellos de Purple Onion Designs. Su nueva colección "Twas the night before Christmas" es adorable. For this first card I used the stamps Front Door, Door Decor, Nora & Butter and the Sweet Occasions Sentiment set and colored everything with Copic Markers. Para la primera tarjeta he usado los sellos Front Door, Door Decor, Nora & Butter and the Sweet Occasions Sentiment set y lo he coloreado todo con rotuladores Copic. For the second card I used the stamps Pine Tree Farm, Theodore and Little and Essential Holiday Greeting Sentiment Set. I also colored everything with Copics and added sparkle with Stickles. You can watch a no-voice video about this card below or at my Youtube channel. Para la segunda tarjeta he usado los sellos Pine Tree Farm, Theodore and Little y Essential Holiday Greetings Sentiment Set. También lo he coloreado con rotuladores Copic y he añadido brillo con Stickles. Podéis ver un vídeo sobre cómo he hecho esta tarjeta aquí abajo o en mi canal de Youtube (no tiene voz en off). 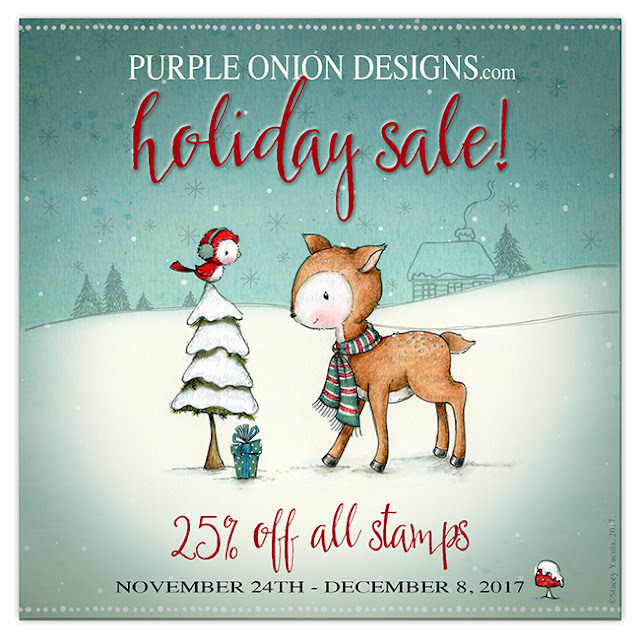 Remember that the Purple Onion Designs sale started last Friday, November 24, 2017 and runs through Friday, December 8, 2017. 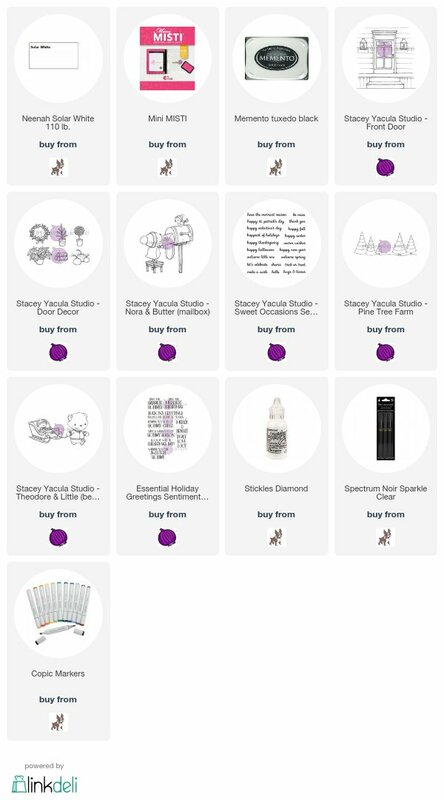 All stamps are 25% off, including all stamps in the sale category. Recordad que las rebajas de Purple Onion Designs empezaron el viernes pasado (24 de noviembre) y duran hasta el viernes 8 de diciembre de 2017. Todos los sellos tienen un 25% de descuento, incluídos los que ya están en la sección rebajada. I missed hearing you but really love the card you made! I think I have just decided that you are my favorite card maker! Have a wonderful and happy holiday season. Thank you for all the inspiration you pass my way! Awww thank you! About the voice, I've been really sick and just couldn't, plus I was a bit in a hurry ;). Amanda you have done it again, such an awesome card. Your colouring is nothing short of amazing. I have pinned it for reference but also for inspiration. I can hardly wait until I have time to practice colouring some trees in hopes to mimic yours. Lol TFS!